Aztec boasts over 30 miles of mountain bike trails that range from rugged, Pinon tree and desert scrub badlands to playful slickrock areas to heart-thumping single tracks. At the forefront is the Alien Run, ranked among the more technically challenging and scenic mountain bike trails in the Four Corners. A great spot for the weekend warrior, the Glade Run Recreation Area is comprised of 19,000 acres of sandy arroyos, slick rock and rolling terrain. Vegetation is sparse, primarily consisting of common grasses, rabbitbrush, sagebrush, junipers, and pinions. An area designated by the BLM that is has for many years been used for horse-back riding in the area south of Navajo Lake. Currently the area is traversed with oil field roads which provide accessibility to the trails. 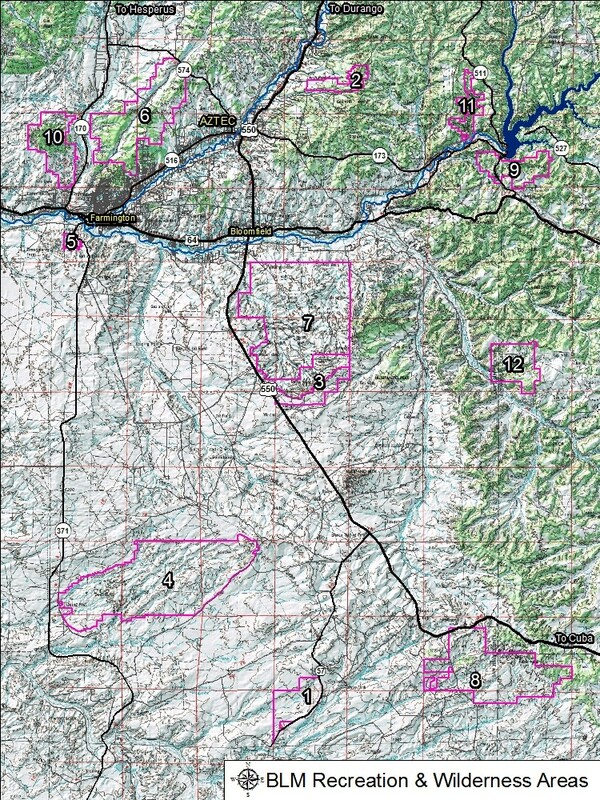 An area designated by the BLM that is undergoing development for mountain bike riding trails west of the Glade Run Area. Currently the area is traversed with oil field roads which provide some accessibility to some of the mountain bike trails. A BLM wilderness study area, "Ah-shi-sle-pah" are eroded badlands that like the Bisti offer some of the most unusual scenery in the Four Corners. Time and Mother Nature have etched a fantasy world of strange rock formations. Most commonly found in the Ah-shi-sle-pah are hoodoos, petrified logs and stumps, and fossils from the late Creteous era (dinosaur, crocodilian scutes, and turtle shell). This 10,000-acre landscape is celebrated for its rugged and scenic wonders, including 7,000-foot Angel Peak. The river-deposited San Jose Formation sandstone is visible for miles in any direction. The banded colors of the badlands and the deep sculpted canyon fingers are fully revealed only to those who make the short journey along the rim. BLM managed, overnight camping and picnics. A federal wilderness area, "the Bisti" are eroded badlands that offer some of the most unusual scenery in the Four Corners. Time and natural elements have etched a fantasy world of strange rock formations. Bisti (pronounced bis-tie) is Navajo for "a large area of shale hills." De-Na-Zin (deh-nah-zin) is Navajo for "cranes." Petroglyphs of cranes have been found south of the wilderness area. An area designated by the BLM that is of paleontological significance. This area is located adjacent and north of the Angel Peak Scenic Area and consists of the valley and ridge systems that feed into the San Juan River. The area is extensive and has numerous oil field roads scattered throughout. Little is known or recorded about this area in terms of hiking and other outdoor recreation. A BLM area designated as a 'Fossil Area' this area is commonly referred to as the Lybrook Badlands. This area is somewhat similar to the Bisti and Ah-shi-sle-pah Wilderness areas. It consists of extensively eroded badlands with scattered strange rock formations, banded clay domes, massive hoodoos, and fossils from the late Cretaceous era (dinosaur, crocodilian scutes, and turtle shell). A BLM area designated as a scenic wilderness, these 11,000 acres are characterized by steep-sided mesas, remote box canyons, meandering arroyos, and austere badlands. Primitive camping is allowed. Simon Canyon Area of Critical Environmental Concern (ACEC) is about 3,900 acres in size and is managed for semi-primitive forms of recreation including fishing, hiking, and backpacking. Development at the mouth of the canyon is minimal (with a parking lot, picnic table, and toilet) and provides the visitor an alternative to the more highly developed state park sites located nearby. Report any vandalism to the Bureau of Land Management (BLM) hot line at 505-564-7600.